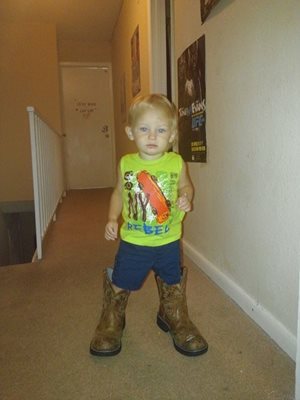 JACKSONVILLE, Florida - The Jacksonville Sheriff's Office announced on Monday that investigators believe they have found the remains of one-year-old Lonzie Barton who went missing on July 24, 2015. The toddler's mother, 26-year-old Lonna Barton, was charged and pleaded guilty to child neglect and providing false information to the police regarding the boy's disappearance. Her boyfriend, 32-year-old Ruben Ebron, remains the prime suspect in the case. "Because we were able to go ahead, by working with the defense, to find this child's body, we set in motion another series of events that will happen in the courtroom at sometime in the next few weeks," State Attorney Angela Corey said at a news conference today. However, Corey would not comment on the specifics of those anticipated events. The toddler's remains were located by investigators in a wooded area near Philips Hwy and 9B in Duval County, Florida with the cooperation of Ebron following discussions with Ebron's attorney. "We have worked with the attorney's of Ruben Ebron. Ruben Ebron was at the search site yesterday and cooperated with us," the Sheriff's Office wrote on its Facebook page. "This is the first step in Justice for Lonzie. Lonzie did not need to be discarded like a piece of trash. He will now spend eternity somewhere that is peaceful and not in a horrific garbage heap. This case is not over."